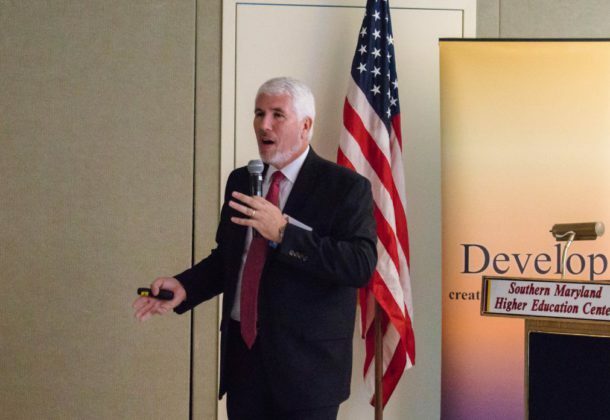 The Department of Defense has new and existing authorities to cut through traditional, lengthy acquisition processes, Tim Morris, former director of F-35 development for the Air Force, told an audience at a briefing on rapid acquisition hosted by The Patuxent Partnership this month. Mr. Morris, currently the manager of acquisition management for WBB Inc., gave a nod to the room full of NAVAIR contractors and said, despite his Air Force background, the potential of underutilized rapid acquisition authorizations now in place applies to them as well. Referred to as Sections 803, 804, 805, and 806, these and a few other auxiliary authorities in the National Defense Authorization Act seek to accelerate getting identified requirements and new capabilities fielded within five years. What the Department of Defense needs, immediately, are “fieldable prototypes that demonstrate new capabilities and meet emerging needs,” Mr. Morris said. The sections address reducing the time and procedural delays that hamper contractors from rapidly responding to the needs. There are many needs demanding immediate attention. US adversaries are advancing prototype after prototype and multiple generation aircraft in the time it takes the US to develop one weapon system. “Where can we save time?” he asked and projected a chart of Air Force aircraft comparing how long each had spent in the various stages of acquisition. The most significant time increase in fielding a new system is in the earliest stages. “If you look at a lot of these programs from the time they started to first flight – it’s about the same,” said Mr. Morris. The rapid acquisition authorities have been in place since the FY16 NDAA. “Congress is getting impatient,” Mr. Morris said. In FY18 lawmakers began exerting pressure on DoD to move aggressively on these authorities. Section 803 is about “doing things fast” and addressing “urgent operational needs” such as in Iraq and Afghanistan. Section 805 is a high DoD authority described in the law as the use of alternative acquisition paths to acquire critical national security capabilities. It was Section 804 that Mr. Morris most encouraged Pax contractors to consider. Section 804 is a prototyping multi-tier acquisition for rapid prototype and rapid fielding within two to five years. It’s six months to start and there is no dollar amount attached to the authority, according to Mr. Morris. He also elaborated on Section 806, which allows the Secretary of Defense to waive acquisition laws to acquire vital national security capabilities – getting technology into the field now, from prototype to demonstration and operation. The requirement seeks to meet high priority needs of the warfighter or to reduce the cost of the system.